More cash as the vote nears could help legalization foes. PHOENIX — Foes of legalized recreational marijuana are building up a war chest in a bid to kill Proposition 205, apparently with a last-minute barrage of media. New reports filed with the Secretary of State’s Office show that the anti-205 Arizonans for Responsible Drug Policy has so far collected slightly more than $2 million. That still leaves the group short of the nearly $3.2 million reported by the pro-205 Campaign to Regulate Marijuana Like Alcohol. But the pro-205 forces already have burned through more than $3 million of that, much of it to get the measure on the ballot in the first place. The latest report shows that organization has less than $170,000 on hand. By contrast, the campaign to kill the measure reported it has close to $1.4 million in the bank. That cash differential could prove crucial. Various polls have come up with conflicting results. One from July had the measure failing with 52 percent of those questioned opposed. Another one released last month suggested the initiative had 50 percent support. But the tide could be on the side of initiative foes, and not just because of the financial edge. Pollster Earl de Berge said that, generally speaking, when people are undecided or confused, they tend to vote “no” on ballot measures. And pollster Michael O’Neil, who did not conduct either survey, said that even if proponents really do have a 10-point lead, that’s not good news at this point in the election cycle. He said that’s probably a high point and it’s unlikely that number will improve between now and the election. “I disagree with that,” responded Barrett Marson, spokesman for the legalization campaign. He said proponents are conducting a “vigorous” campaign and continuing to raise money. More than $1 million in support of 205 has come from the national Marijuana Policy Project and its separate foundation. But most of the rest has been in the form of five- and six-digit donations from the operators of existing dispensaries, people who will get first crack at the limited number of retail outlets that the initiative will allow — a point that anti-205 spokesman Adam Deguire uses to counter Marson’s comments about the Insys donation. Deguire said his group is using its funding for television advertising in hopes of convincing voters that this is different than the medical-marijuana law they narrowly approved in 2010. “This isn’t necessarily a fight about marijuana,” Deguire said. He said there are things in Proposition 205 that even voters who support legalized marijuana might not want. 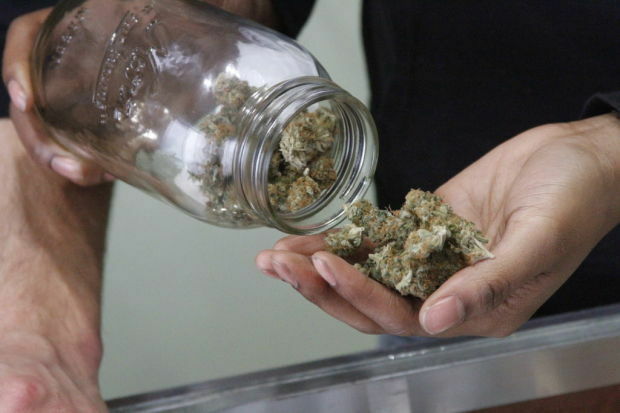 The 2010 ballot measure that squeaked by allows individuals with certain medical conditions, a doctor’s recommendation and a state-issued ID card to obtain up to 2½ ounces every two weeks from a state-licensed dispensary. Proposition 205 would allow any adult to have up to an ounce at a time, purchased through an expanded retail dispensary system but with a 15 percent tax added on. The measure also would spell out certain rights of marijuana users as to employment and child-custody cases. Driving while impaired on marijuana would remain illegal. But unlike alcohol, where a blood-alcohol content of 0.08 is presumption of impairment, there is no such standard in Proposition 205. That would require prosecutors to prove in each case that the motorist was impaired. Proponents have spent much of their resources to date on their claims that revenues from the tax would benefit education. Foes counter that similar promises were made to Colorado voters before they legalized recreational marijuana, but the funds have not materialized. But the prime message of the anti-205 forces has been that making marijuana more available to adults will lead to greater accessibility and use by minors. They also point out that the Arizona law specifically allows the sale of marijuana-laced candy bars, lollipops and other edibles that might be attractive to children. If approved by voters, would allow residents to obtain ounce of drug legally.